"The LORD said to Moses, "When you go back to Egypt see that you perform before Pharaoh all the wonders which I have put in your power; but I will harden his heart so that he will not let the people go." (Ex 4:21) What does it mean to "harden" one’s heart and that God will do it? Are human beings in any way responsible for this "hardening"? In the Old Testament, "hardening" is largely expressed with the Hebrew word "qāšâh." It means to "make strong", "make firm", "make rigid" or "make hard". The Greek equivalent is seen in "sklēros," "sklērynō," "pōros (pēros)" and "pachys." The word "sklēros" is used exclusively in the metaphorical sense throughout the New Testament and means "hard" or "rough". It is also used as a compound in "sklērotrachēlos" (Acts 7:51, meaning stiff-necked and obstinate), and "sklērokardia" (Mark 3:5; 10:5; Matt 19:8, meaning hard-heartedness). The Greek verb "sklērynō" is used grammatically as a transitive on human beings as a direct object. It is used metaphorically to mean "to become obstinate, stubborn" (Acts 19:9; Rom 9:18; Heb 3:8, 13, 15; 4:7). Derived from the word group "pōros", the Greek verb "pōroō" is only used in the figurative sense in the New Testament, and it means "to become hard" (Mark 6:25; 8:17; John 12:40; Rom 11:7; 2 Cor 3:14). The verbal noun "pōrōsis" is also used in the New Testament only in the figurative sense and means "hardening" (Rom 11:25; Eph 4:18). Of all the words used for "harden", "pōrōsis" provides the strongest sense. More than a mere stiffening of one’s soul and character, "pōrōsis" implies the outgrowth of a new feature, which obscures while it hardens, of an outer coating of mental obduracy or permanent bluntness. The Greek term "pachynō" is used figuratively to mean "to make insensitive" or in the passive "to be insensitive" (Matt 13:15; Acts 28:27). 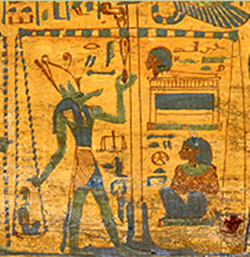 How did Pharaoh view the heart? The idea of hardening one’s heart is first found with Pharaoh. There are ten places where the hardening is ascribed to God (Ex 4:21; 7:3; 9:12; 10:1, 20, 27; 11:10; 14:4, 8, 17) and ten places where Pharaoh hardened his own heart (Ex 7:13-14, 22; 8:15, 19, 32; 9:7, 34-35; 13:15). It is worthwhile noting that Pharaoh alone was responsible for the hardening in the first sign (Ex 7:13) and first five plagues (Ex 7:14, 22; 8:15, 19, 32; 9:7) despite seeing for himself the supernatural signs of God. It wasn’t until the sixth plague that God moved to harden Pharaoh’s heart (Ex 9:12). God’s hardening reinforced Pharaoh’s own hardness; Pharaoh would not be persuaded to free the nation of Israel, which was as God predicted (Ex 4:21-23). The Egyptian army is the first mention of a group of people who God hardened (Ex 14:17). God would receive glory from Pharaoh and his army whether Pharaoh submitted or not. There are other instances where the Bible records God of initiating the hardening of hearts of human beings. Sihon, the Amorite king of Heshbon was hardened (Deut 2:30; Num 21:21-35). However, it should be noted that the rout of the Amorites was God’s act of judicial judgment of their sin (Gen 15:16), and that judgment took place several generations later! Just as Sihon, the Canaanites were also hardened (Josh 11:20), and biblical evidence indicates that God judged them as well (Deut 7:1-11). God commands Moses to "utterly destroy them, the Hittite and the Amorite, the Canaanite and the Perizzite, the Hivite and the Jebusite…" (Deut 20:16-18). The Canaanite worship of Baal was notably detestable for its sacrifice of human infants, and subsequently, the Jews would be confronted for their sins of idolatry with comparisons to the idolatrous nations of Canaan that preceded the Jewish Conquest (Jud 10:6; 1 Kings 11:5-7; 14:24; 2 Kings 16:3; 21:11; 23:13; 2 Chron 36:14; Ezra 9:1, 11). Not only were the religious practices of these nations idolatrous, but they degraded human beings (Lev 18:24-28). c) God does not appear to harden to prevent one from repenting but instead to prevent one from surrendering in unrepentance. The Canaanite Rahab (Josh 2:1-22) is an example of one who was saved because of her faith (Rom 10:11-13). God would later honor her as a part of Jesus’ genealogy (Matt 1:5) and as an example of faith (Heb 11:31; James 2:2). In another instance of divinely hardened Canaanites who avoided God’s judgment of annihilation, the Gibeonites came to Joshua acknowledging the God of Israel (Josh 9:9-11). Although they tricked Joshua into a treaty (Josh 9:3-27), who did not seek the Lord’s guidance (Deut 7:1-3; 20:16-18), Joshua let them live as woodcutters and water-carriers, because the leaders of Israel made an oath to the Lord (Josh 9:18-21). Did the Gibeonites have a genuine faith in God? Because of king Saul’s killing of Gibeonites "in his zeal for the children of Israel and Judah", God brought a three year famine upon the nation of Israel, and king David gave 7 grandsons of king Saul for the Gibeonites to hang in retribution (2 Sam 21:1-6). d) God hardens as a means to fulfill His covenant promises and bring glory to Himself (Rom 9:17-18). The figurative phrase "hard heart" describes an obstinacy towards God’s call and command. Proverbs characterized the ungodly as hard hearted or stiff necked for their steadfast refusal to listen to God (Prov 28:14; 29:1). With the same figurative sense, the Psalmist warns against the unbelief that is at the core of a "hard heart" (Ps 95:8-11). Remarkably, though they did not have a belief in God, the Philistines recognized that a hard heart brings divine retribution and returned the Ark of the Lord with gold offerings (1 Sam 6:6-8). Despite being chosen as God’s own people (Gen 17:7), the Bible indicates that the Jews hardened their hearts (2 Chron 36:13; Zech 7:12). The prophet Isaiah confronts the nation of Israel for their failure to listen to the word of God. The nation of Israel is compared to a vineyard that did not want to bear fruit and is now unable to, because God will not protect, care for or water it (Isa 5:1-7). Because the nation of Israel no longer wanted to listen to God, they would be unable to (Isa 6:9-10). God’s word would still be proclaimed; but, they will be unable to understand (Isa 28:12-13). God’s judgment will be the destruction of the nation (Isa 6:11-13), which occurs with the Babylonian Exile (2 Chron. 36:17-20). Even with the knowledge of Israel’s ultimate deliverance, restoration and coming Messiah (Isa 58, 59, 60, 61), Isaiah was fully aware that Judah’s sin was going to bring devastating judgment. In lamentation, Isaiah recognizes that sin hardens the heart and by God’s design, "Why, O LORD, do You cause us to stray from Your ways and harden our heart from fearing You?" (Isa 63:17). Isaiah’s prophecy in Isaiah 6:10 would not be fulfilled until Jesus enters (John 12:36-41). The "insensitive heart" mentioned in Isaiah 6:10 is recounted by John as "harden their heart" in John 12:40 as he refers to the Jews. The New Testament makes the first mention of "hardened hearts" of the Pharisees (Mark 3:5; 10:5; Matt 19:8). In Mark 3:4-5, Jesus uses the compound Greek term "sklērokardia" to describe the Pharisees’ stubborn failure to recognize who He really was: Jesus the Messiah who was sovereign and free of any law and custom. According to Rabbinic law, healing on the Sabbath was permitted only in the extreme case of saving a life. In Mark 10:5 and Matthew 19:8, Jesus uses the term to explain that Moses’ concession (Deut 24:1-4) did not reflect the true intent of God’s perfect design for marriage (Gen 2:22-24) but because of Israel’s hard heart. Then as now, the rabbis mistook God’s gracious provision in allowing divorce as His approval of it. Jesus also describes the disciples as having hard hearts (Mark 6:52; 8:17)! In Mark 6:52, Mark attributes the disciples’ panic at seeing Jesus walk on water and astonishment at calming the water to their failure of understanding the multiplication of the loaves (Mark 6:33-44). Had they understood the deity of Jesus, they would have been prepared for His supernatural abilities. In failing to see that Jesus was the Messiah, their hearts were hardened just as Jewish religious authorities. In Mark 8:17, Jesus warns His disciples of the "yeast of the Pharisees and Herod" which is the sought after sign from God to validate His authority and Messianic purpose. Once again, despite two instances of the supernatural provision of bread (Mark 6:33-44; 8:1-9), Jesus rebukes His disciples for failing to see, hear and understand that He is the Christ. When the apostles make a reference to hard hearts (Acts 7:51; 19:9; Rom 11:7, 25; 2 Cor 3:14; Eph 14:18), it is a description of people who do not open themselves to the gospel. It is the refusal to believe what eyes have seen and what ears have heard that Jesus was in fact the Christ, the promised Messiah who came to redeem and whose promise of salvation was true. Instead of recognizing Jesus’ authority of the Holy Spirit, Jewish religious authorities attribute it to an evil spirit, "He casts out demons by the ruler of demons" (Mark 3:22). Instead of recognizing Jesus’ resurrection and empty tomb, Jewish religious authorities bribed the tomb guards, "and said, You are to say, ‘His disciples came by night and stole Him away while we were asleep. And if this should come to the governor’s ears, we will win him over and keep you out of trouble.’ And they took the money and did as they had been instructed; and this story was widely spread among the Jews, and is to this day." (Matt 28:13-15). Paul speaks of hardening in the context of divine sovereignty without losing sight of a human being’s personal responsibility. Following Romans 10, Romans 11:7-10 makes reference to the Old Testament (Deut 29:4; Isa 29:10) as Paul speaks to Israel’s failure to achieve righteousness through works and instead being hardened ("pōrōsis" is used here – hardening in the strongest sense). Despite seeing God’s miracles that led to the Exodus, their miraculous provision in the wilderness and faithful testimony of God’s prophets, Israel did not develop a loving trust of God and shut their ears to His words. For their failure to see and hear His manifest existence and glorify Him, God exacted judicial punishment by sending them a spirit of stupor. Despite this, Paul is very clear that hardening is the liability of each person, "but because of your stubbornness (sklērotēs) and unrepentant heart you are storing up wrath for yourself in the day of wrath and revelation of the righteous judgment of God who will render to each person according to his deeds. (Rom 2:5-6). With omniscience, God’s foreknowledge of Israel’s hardness against His Son Jesus was part of God’s plan about the Messiah. By temporary rejecting the nation of Israel and bringing salvation to the Gentiles (Rom 11:11), God intended to evoke envy on the part of Israel which would lead to their return as God’s people (Rom 11:25-27). The olive tree emphasizes the dependence of the Gentile salvation on Israel’s covenant relationship with God (Rom 11:16-24). Unilaterally and ever faithful, God continues to fulfill His Abrahamic Covenant. It would seem that God would know how each individual or people would freely respond to the influence of others or circumstances, ranging from faith to stubborn obstinate rebellion, all in accordance to the fulfillment of His covenant, unfolding plan of salvation and ultimate realization of His Kingdom. When Jesus asks His disciples if they had a hard heart, He asks, "do you not yet see or understand? Do you have a hardened heart? Having eyes, do you not see? And having ears, do you not hear? And do you not remember,…" (Mark 8:17-18). It is clear that Jesus Christ is calling on an honest appraisal of reality, in our case the recorded testimonies of eyewitnesses in the Bible, and that one would do well to remember Its truth. While our culture prefers to see truth in amoral abstract terms, the truth that hardened hearts are set against is rather concrete in fact. In the Old Testament, people did not believe and place their trust in the God who did in fact do the signs and plagues to the Egyptians that led to the Exodus and provided during their 40 years in the wilderness. In the New Testament, people did not believe and place their trust in Jesus who did in fact do the miracles that testified to His deity and Messianic promise of salvation. 2. Gaebelein F, ed., The Expositor’s Bible Commentary, vol 2, 3, 4, 6, 8, 10, Grand Rapids: Zondervan Publishing House, (1992). 4. Walvoord JF and Zuck RB, eds., The Bible Knowledge Commentary: New Testament, Wheaton, Il: Victor Books (1985).